There he is, my little furry, 4 legged child, Broccoli (don't ask), he was very interested in the little felted wool egg I made. I wonder if it smells like sheep. Today is a RED SATIN PAJAMA DAY. It's working into a blizzard outside. I've built a good fire in the wood stove for Auntie E. & it's a Saturday, my favorite day to turn on PBS & sew along with my friend Sue Hausmann, & Nancy Zieman, & Fons & Porter. 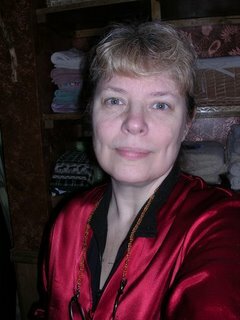 The red satin is my uniform for working on a big quilt. It lets the quilt slide instead of hanging up on my clothes as I do my free-motion quilting. Of course being in Alaska means I also have to wear my long-johns underneath the PJ's. I find that this is a better choice than quilting naked. I've often thought that would be a fun title for a book, "The Naked Quilter". So now I'm going to go down to my studio & work on "the Barn Quilt". It's as big as a barn, & makes me wish I had that Longarm machine that I'll get someday. (sigh) At least I have a studio now. I am very grateful. 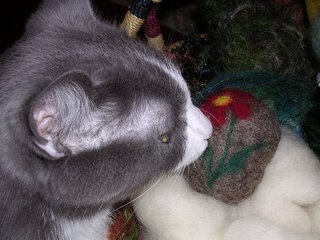 You can make felted balls with the plastic cat toys (with bell) inside. Broccoli would probably love it. Love your Aussie challenge quilt - beautiful colors. And the Dolphin quilt...Wow. Dealing with a similar situation in regard to Aunt Ethel. Sad, frustrating, frightening - to both victim and caretaker.